On Holy Saturday, the last day of Holy Week, the eve of Easter Sunday, we had steamed fish at home. We bought a talapia for RM13.00 at the supermarket. This dish alone is enough for the 4 of us. 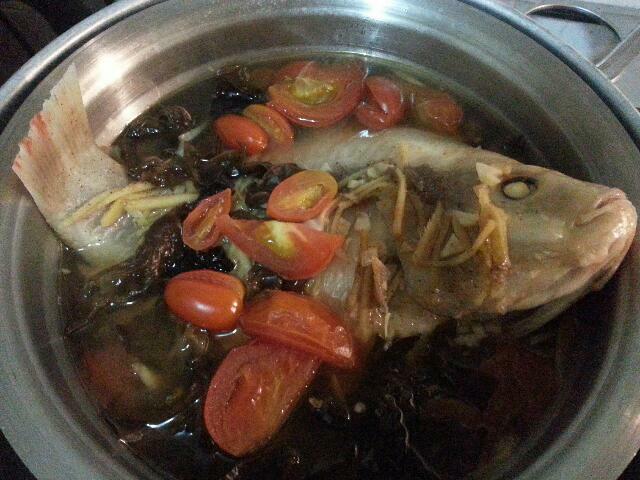 Lots of tomatoes, black fungus and ginger..but we forgot one of my favourite ingredient, the lemon grass. What a happy family meal. I could easily finish a whole fish by myself!! Sounds like an interesting combo! I will keep in mind. :) I grow lemongrass but they're always skinny.